Today I have a simple DIY that is great for using up all those fabric scraps (and glass jars) you may have lying around. Personally, I love using supplies that I already have to make pretty things and this is one project you could definitely make for cheap. Also this is project that you can really customize to fit your own personal style. In this tutorial I will show you how to make a fabric bow for your jar but you could use this idea as a jumping board to create some of your decorative fabric jars. The possibles are endless! 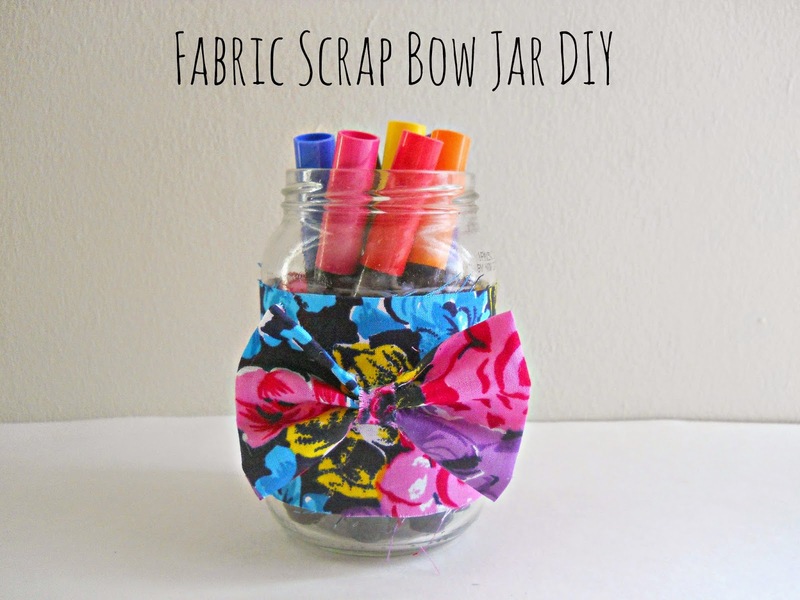 Step 1: Cut a piece of fabric that can fit around your jar. You can use a ruler to measure the piece or just eyeball it. My fabric piece ended up being 4 inches by 12 inches. When you cut out your fabric piece, set it to the side. Step 2: In this step I'm going to show you how to make the fabric bow in five little steps. I added arrows to some of the pictures because I thought it would be helpful. Step 1: Cut a rectangular piece of fabric. My fabric piece was 4 inches by 7 inches (picture 1). Step 2: Fold each side piece into the middle and glue them down with your hot glue gun (picture 2). Step 3: Fold the top edge (down) and the bottom edge (up) and glue them in place (picture 3). All of this folding will give you a nice clean bow with no raw edges. Step 4: Flip your fabric piece over and pinch the middle with your fingers. Where you pinch the bow at, place small drops of hot glue gun and hold together until the bow keeps its shape (picture 4). Step 5: Now take a small strip of fabric, wrap it around the middle of the bow and glue it into place (picture 5). If your still having trouble, I would recommend going to youtube and watching a fabric bow tutorial video.There are tons of good videos out there and each one has basically the same bow making technique. Step 3: Take your fabric piece from step one and wrap it around your jar (you may have to cut some of the extra fabric off). Once your fabric piece fits around your jar, glue it where the two fabric ends meet. Then turn your jar around and glue your bow right in the middle. Once everything is glued into place, your done! This project would be great if you were looking to spice up your workspace or (if your someone headed off to college) would be an inexpensive way to decorate your dorm room. What do you think? Have you ever used fabric scraps in a project? Let me know in the comments below or leave your thoughts on the blog's new facebook page.